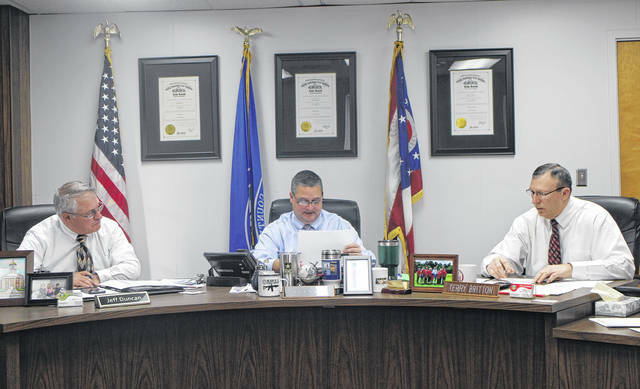 From left, Highland County Commissioners Jeff Duncan, Shane Wilkin and Terry Britton discuss business items during a commissioners meeting on Wednesday. Highland County’s 2018 budget and Mowrystown sewer dilemmas were the primary topics of discussion on Wednesday at a meeting of the Highland County Board of Commissioners. Board president Shane Wilkin said the only county department to request a modification to its bottom-line number was the Highland County Sheriff’s Office. According to Wilkin, the sheriff’s office was originally given a bottom-number total of $2,677,139, but Sheriff Donnie Barrera requested on Tuesday a total of $2,783,239. Wilkin said the increase request was mostly for employee salaries. Wilkin and Highland County Auditor Bill Fawley said the request would be reviewed, but agreed it is unlikely to be granted. As reported by The Times-Gazette, the budget for 2018 will be about $10.3 million, a roughly five-percent increase from 2017. Wilkin again said there were no budget cuts, but some departments’ appropriation requests had to be modified and returned to them. Wilkin also said the county’s sales tax revenue has dipped for the third month in a row. As of Wednesday morning, the commissioners were still waiting on a finalized budget from the Highland County Court in Greenfield. The board is set to approve the 2018 budget on Dec. 27. Also Wednesday, the board heard from Linda Klump, a Mowrystown resident who has been outspoken about sewer bills in Mowrystown. As reported previously, Mowrystown Village Council recently approved a “more aggressive collection process” for sewer bills, since a number of residents have not paid their bills, according to Village Solicitor Fred Beery. Beery said in a letter to commissioners that the decision was spurred by financial stress due to residents not paying their bills in the first place. Beery told The Times-Gazette that the village issued notices to residents delinquent in their bills warning them that if they do not pay, their sewer connection will be dug up and capped off. Klump said village officials have threatened to dig up connections as early as Friday, adding that it was said the health department will condemn homes that do not have the correct sewer connection. Highland County Health Commissioner Jared Warner said he understands Mowrystown’s financial dilemma, but he felt like the village used the health department as leverage to collect bills. “They kind of volunteered us,” Warner said, adding that “creating 20 public nuisances” during the holiday season is not in the village’s best interest. “We’re definitely not in favor of their plan and we’ve told them as much,” he said. Klump also complained of an extra charge on her monthly sewer bill that appeared to be a tax, and asked commissioners if the village can authorize extra taxes. Wilkin said he wasn’t sure of the answer, and suggested Klump speak with Beery on the matter, adding that the commissioners are only responsible for paying the debt on the sewer plant. In other business, Wilkin said the board may approve next month the transfer ownership of the Highland County Health Department’s space at the North High Business Center in Hillsboro to the local board of health. Warner recently told commissioners in an email that a change in the law permits boards of health to own property, adding that if the health board owns its own space at the business center, it will have a seat on the condo board. The commissioners currently own the space. The commissioners also passed routine financial resolutions, and entered executive session to discuss personnel.